Twickenham - Wales may seem Europe's best hope of World Cup glory in Japan this year after winning the Six Nations with a Grand Slam, but injuries could yet play a part by the time the tournament starts in September. The Welsh saved their Six Nations best for last, giving Warren Gatland his third Grand Slam as their coach with a 25-7 win over Ireland in Cardiff on Saturday. Wales are now the first European team to enter a World Cup as Grand Slam champions since England in 2003 -- when Clive Woodward's side became the only northern hemisphere winners of the global showpiece. But Wales have yet to reach a World Cup final and if they are to triumph in Japan they will likely have to beat Gatland's native New Zealand, the reigning champions -- and no Wales side have defeated the All Blacks since 1953. 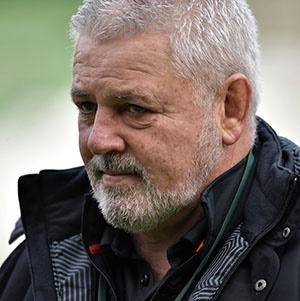 "I'm excited about the World Cup because you get that two or three months together as a side and you can prepare like a club side, you can go into skill work and skill development and really fine-tune your game," said Gatland after Saturday's success. Questions over England's resolve, raised by Gatland following a 21-13 defeat by Wales last month, returned with a remarkable 38-38 draw against Scotland at Twickenham on Saturday. England, astonishingly, blew a 31-0 lead on home turf -- something impossible to imagine New Zealand doing at their Eden Park fortress in Auckland. Itoje, however, is one of several England regulars, including captain Owen Farrell, who play for Premiership champions Saracens. The London club will likely have more fixtures -- and so more chance of injuries -- as they continue their quest for both domestic and European glory this season. "You want these sorts of lessons before you go to the World Cup," said England coach Eddie Jones. "Because you do that in the pool game against Tonga, for instance, then you can find yourselves in a difficult situation going forward," added Jones, who was in charge of his native Australia when they were beaten by England in the 2003 final. Ireland have yet to get beyond the quarter-finals of any World Cup. They must also cope with the nagging suspicion they peaked in 2018 when Ireland completed a Grand Slam before beating the All Blacks. "We haven't been catastrophic, but we haven't been as good as we needed to be," said Schmidt after Saturday's defeat. France have often put poor European form behind them at a World Cup -- and in 2011 they even suffered two pool defeats before before an agonising 8-7 loss to hosts New Zealand in the final. They got past perennial strugglers Italy 25-14 in Rome on Saturday for just their second win this Six Nations but France coach Jacques Brunel insisted: "I said it from the beginning, the World Cup is a completely different competition, reduced to four decisive matches (in pools), history has shown it to us many times." Scotland were just one controversial penalty decision away from a World Cup semi-final four years ago before losing to Australia.